It sounds like the simple act of opening a card turned into a big ordeal for a resident (and Southborough’s first responders) yesterday. A Southborough man contacted emergency services to report a small bag of white powder in his mail. The substance was determined to be “illegal” but “non-hazardous”. Before reaching that conclusion, a lot went into taking necessary precautions. 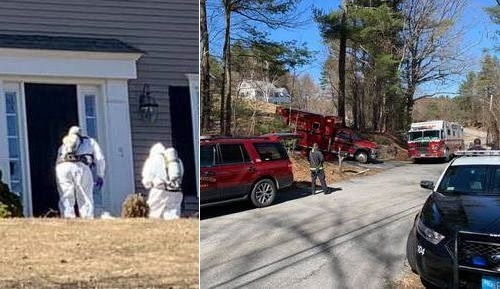 At approximately 1245 PM on Monday, March 25, 2019, Southborough Fire and Police were dispatched to 15 Nichols Street for a report of a letter containing a suspicious substance. A male occupant of the single-family residence, owner and only occupant at the time, reported he had open a card he received in the mail and observed a small plastic bag containing what appeared to be white powder. He reported that none of the powder had released form the bag and had placed all items involved outside his front door. Fire crews responded with a command vehicle, engine and ambulance complimented by one officer and four firefighter/paramedics. Police responded with the on-duty Sargent and one patrol officer. Off-duty fire personnel were requested to provide station coverage. During response to the incident, the Massachusetts State Hazardous Materials (Hazmat) Team, part of the Special Operations Division under the Department of Fire Services, was contacted. Subsequently the District 3 Hazmat Team was dispatched as a Tier 1 response. The Tier 1 response consisted of five hazardous material technicians and one Tactical Operations Mobile unit. The US Postal Service Inspector and Southborough Postmaster were also notified. Upon arrival, fire and police established a Unified Command Post and a safety perimeter. After confirming the occupant had not been exposed to the substance, an Operations Section was established consisting of two firefighters and one police officer. These members made entry into the perimeter to conduct further investigation, while two firefighter/paramedics remained with the ambulance as emergency backup. Crews visually confirmed the unknown substance was confined to the plastic bag and established an isolation zone, commonly referred as a hot zone, around the items. Upon arrival, the Unified Commanders provided the District 3 Hazmat Team members with a situational briefing of the incident. Two Hazmat Technicians, wearing Level C hazmat suits and full self-contained breathing apparatus, conducted several field tests on the substance. Test results determined the powder to be a non-hazardous illegal substance. The Hazmat Technicians safely secured the powder and transferred custody to the Southborough Police Department for further investigation. There was/is no dangers to the area/community and no injuries were reported. All fire, police and Hazmat crews cleared the scene at 3:36 PM. You can see more pics shared on Facebook here.